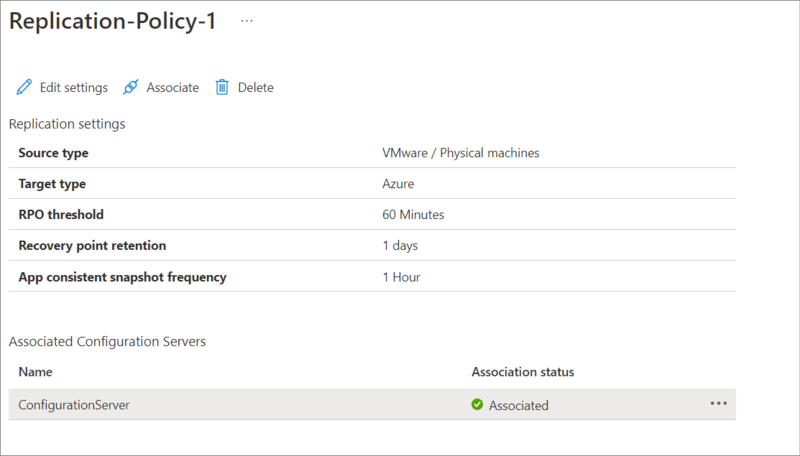 This article describes how to configure a replication policy when you're replicate VMware VMs to Azure, using Azure Site Recovery. Select Manage > Site Recovery Infrastructure. In For VMware and Physical machines, select Replication policies. Click +Replication policy, and specify the policy name. In RPO threshold, specify the RPO limit. Alerts are generated when continuous replication exceeds this limit. In Recovery point retention, specify (in hours) the duration of the retention window for each recovery point. Protected machines can be recovered to any point within a retention window. Up to 24 hours of retention is supported for machines replicated to premium storage. Up to 72 hours is supported for standard storage. In App-consistent snapshot frequency, choose from the dropdown how often (in hours) recovery points that contain application-consistent snapshots should be created. If you wish to turn off generation of application consistency points, choose "Off" value in the dropdown. Click OK. The policy should be created in 30 to 60 seconds. When you create a replication policy, a matching failback replication policy is automatically created, with the suffix "failback". After creating the policy, you can edit it by selecting it > Edit Settings. Associate the replication policy with your on-premises configuration server. Click Associate, and select the configuration server. Click OK. The configuration server should be associated in one to two minutes. Select Manage > Site Recovery Infrastructure > Replication Policies. Select the replication policy you wish to modify. Click Edit settings, and update the RPO threshold/recovery point retention hours/app-consistent snapshot frequency fields as required. If you wish to turn off generation of application consistency points, choose "Off" value in the dropdown of the field App-consistent snapshot frequency. Click Save. The policy should be updated in 30 to 60 seconds. Choose the replication policy. a. To dissociate the policy from the configuration server, make sure that no replicated machines are using the policy. Then, click Dissociate. b. To delete the policy, make sure it's not associated with a configuration server. Then, click Delete. It should take 30-60 seconds to delete.